While some people are naturals when it comes to convincing others of something, it isn’t a skill everyone possesses. 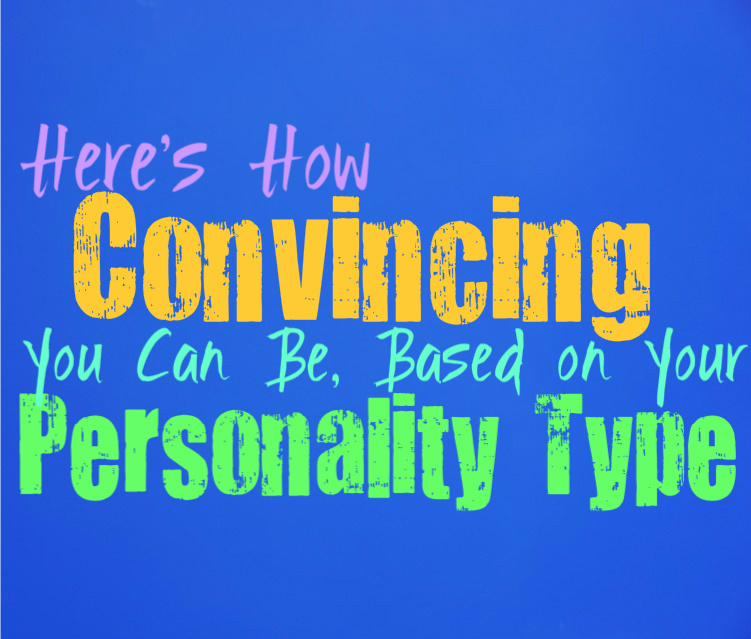 Here is how convincing you can be, based on your personality type. INFJs can be very convincing people when they want to be, since they are naturally in tune with the emotions of others. They can often find ways to coerce a situation so that they can convince someone of just about anything. While INFJs do possess this ability in abundance, they don’t always seek to act on it. Oftentimes their ability to convince others is something they use to help them in some ways, sometimes just to convince them of how special they truly are. INFJs are also skilled at convincing people of certain facts, but in most situations they try to do this in a helpful way. ENFJs are definitely good at convincing others of many things, since they are so naturally in tune with the emotions of others. This helps ENFJs become more skilled when it comes to convincing people, since they can often see into their deepest hearts desires. ENFJs usually try to use these abilities to help others and to guide them down the right path in life. They care for their loved ones and truly want to do whatever they can to make them happy. ENFJs also use their convincing abilities to help other people become more aware of their own positive qualities. INFPs can definitely be convincing people, but this is mostly because they are so sincere. They believe in being upfront and don’t like to share half-truths to others. When the INFP believes in something it comes from the heart, and that is why they can become so convincing about these topics. INFPs don’t like trying to convince people of something they don’t personally believe to be true or moral, so in these situations they likely won’t even attempt to. INFPs simply believe it is important to be honest with others and to do their best to always make the right choices. ENFPs are definitely capable of being convincing, and can do so with ease. While ENFPs are often capable of convincing others of just about anything, they prefer to be upfront and honest. They strive to be sincere with others and dislike doing anything that feels like they are lying in some way. ENFPs have such strong inner morals and believe in going above and beyond to do what is right and good. They can convince people of just about anything in a rather impressive manner, but ENFP prefer to only convince people of the truth. INTJs can certainly be convincing and even stubborn when they believe in something. To INTJs it is important to spread the truth to others, and they dislike seeking ignorance in the world around them. For the INTJ it is important to use facts to be convincing to others, instead of flash and flair. They simply present the truth and if people are too foolish not to believe it, that is their own failing. They value sharing this information with others but they won’t go above and beyond to convince others of something. For ENTJs being convincing is simply something they do by being truthful and accurate. They also have quite the commanding presence with helps people believe in them as an authority. ENTJs are confident when they express something and this helps them become much more convincing to those around them. While they don’t believe in going out of their way to convince people in most situations, there are some occasions where it is important to be convincing. For example during a work event the ENTJ might need to convince others of information, and they will certainly be skilled at doing this. INTPs are intelligent people who can use their wit and knowledge to be convincing. While INTPs do strive to convince others of important information, there are times when they can find it difficult to really put their thoughts into words. INTPs have so many millions of thoughts and pieces of intuitive information floating around inside of their minds, that sometimes it can be a bit challenging for them to actually put this into words. For the people who trust the INTP they can certainly be convincing, since they are confident in their own knowledge. ENTPs are definitely capable of being convincing, since they are naturally charming people. Their ability to use their charisma to convince people of things is something ENTPs aren’t afraid to take advantage of. They enjoy pushing their own limits and seeing how far this might take them, mostly for the sake of learning and reaching a deeper understanding. ENTPs enjoy being able to challenge themselves and push the boundaries of those around them in order to understand them better. ENTPs are certainly skilled at convincing people when they want to, but they do believe in being honest in the end. ISTJs are upfront people, and prefer to use the truth to be convincing. They dislike having to come up with flashy ideas in order to convince others of something. For the ISTJ it is more valuable to be honest and simply hope that people are smart enough to believe them. If people are not convinced then they more than likely view them as a bit of a lost cause, and don’t believe in wasting their energy on trying to make them believe in what is true. ESTJs have a commanding presence which can certainly help them be more convincing to others. They have the ability to put themselves in a position of authority, which makes them rather convincing. ESTJs do believe in being upfront though, and because of this they dislike having to come up with flashy ways to convince others. For the ESTJ it is their confidence that helps them be more believable to those around them, and helps them maintain this sense of authority. ISFJs do have a convincing personality, especially since they are so in touch with the emotions of others. ISFJs are sincere and caring people who often use their convincing abilities to help others. They want to let their loved ones know how they view them, in order to help them live happier lives. For ISFJs it is more important to make others happy, and this is their main focus in life. They simply want to create a sense of harmony in their environment, which they often use their convincing abilities to do this. ESFJs are rather convincing people, since they are so in touch with the emotions of others. They can often understand the inner desires and goals of others, and this helps them become more convincing. They are capable of understanding what people want and will definitely try to provide this for them. ESFJs are charismatic and compassionate people who do whatever they can to please their loved ones. They go above and beyond to make others happy, but their awareness of others does help them become more convincing. ISTPs can definitely be convincing if they want to be, since they are charming people. But in most situations ISTPs don’t really enjoy having to convince others of anything. For the ISTP it is more valuable to be upfront and provide others with facts in order to convince them of something. They dislike having to try and convince others and would much rather people simply believe the truth that is in front of them. ESTPs are charismatic people who can certainly convince others of things. They are capable of understanding what people want and have a natural salesperson attitude. ESTPs have a knack for using their wit and charm to persuade people into believing them of pretty much anything. While this is something they are capable of, ESTPs can become bored of having to convince their loved ones of things and would rather have them simply believe in what they say. ISFPs prefer to use honesty in order to convince people, and dislike having to pretend. They would rather have people in their lives who believe in them and what they say. While ISFPs would rather be honest they can be rather hurt when their loved ones don’t believe what they say. They won’t go out of their way to convince them though, and believe it is important to stand by what they believe in instead of having to deviate. ESFPs can certainly be convincing, especially since they are outgoing and likable people. They often go out of their way to convince others of something and are good at being able to do this. ESFPs are social people who enjoy being around others and want to be liked by those people. ESFPs also believe in being honest, and would certainly rather be able to be upfront about their feelings in beliefs. While they prefer honesty there are times when the ESFP might steer away from the truth if they are afraid that it might anger someone else.